Being a reputable Android App Development Company, we at SocialEngineMarket provide custom-based Android App solutions of superior quality at reasonable cost. This operating system is highly customizable and convenient, which makes it the leading choice of smartphone users nowadays. Its market is continually evolving. To be able to provide the best Android application development services, we follow all the updates implemented in the system and advance our skills accordingly. Our aim is to build Android apps that are not only great performing but also tailored to the needs of your users. We focus on your business goals and target audience in order to achieve the most effective results. Our team forms a personal approach towards each project, which helps us designing bespoke applications with unique interfaces and functionality. There are no boundaries for us. We are an app development company that is not afraid of complex tasks and long distances between us and our valued clients. Combining suitable for your support with strong Android expertise, our specialists have been delivering seamless Android applications for years. Not sure what your app must be like? Not a problem! If you have an idea that's a huge deal. Having a mobile app for your business is crucial today, and we are glad to assist you at any stage of its development. A solid base in mobile development and up-to-date UX/UI research base allow us to create truly competitive applications from scratch. We have a significant experience in social networking programming. Knowing the ins and outs of the field, we craft robust branded and social communities and mobile apps for their members who use Android. Our mobile app designers accumulate their creativity and professional knowledge to tailor exclusive interface that would show your unique brand image. 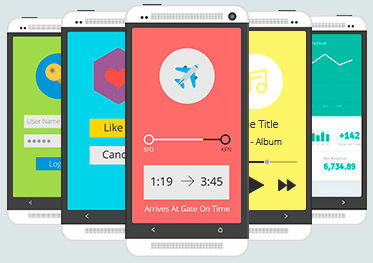 To make an app not just modern and visually attractive, but also easy to use, they apply the latest UI/UX principles. 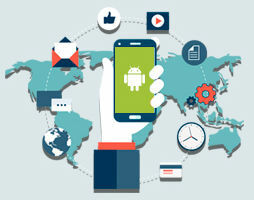 Multiple Android offerings allow making virtually powerful corporate applications. Regardless of the size of your organization, a dedicated app is always a good idea. Gather all the necessary information and activity in one system and let employees access it from their smartphones, smartwatches, tablets, etc. If you already have an app though it leads to little or no results, there may be usability issues. Our experts regularly analyze user behavior and conduct UX research. Customizing an app according to this data we are able to significantly improve its performance. Mobile shopping is getting more and more popular. We are reliable providers of programming solutions for e-business. Entrust us your project and let customers purchasing products wherever they are and enlarge your audience exponentially. Android is well-known for its flexibility. We know how to properly manipulate such an advantage. Our coders and designers have constructed native applications for many and various domains, among which entertainment, healthcare, travel, education and other. Android is appreciated by over 80% mobile users all over the world. It is not just innovative, due to frequent refreshments and upgrades. It is considered the most open for creativity platform as well. All together it allows developing really beautiful, user-friendly and high-functional next-gen applications. SocialEngineMarket is one of the best providers of Android system solutions for small and medium-sized enterprises. Our developers and designers love working with this OS, and the high level of the services they provide conveys this love. Let us build a secure and effective mobile app that you can benefit from.